At a time when a female candidate is at the frontline of the presidential race, Difficult Conversations Just for Women: Kill the Anxiety. Get What You Want.—a women-only communication book—becomes number one hot new releases in multiple lists. Difficult Conversations Just for Women: Kill the Anxiety. Get What You Want. OVERLAND PARK, Kan. - July 14, 2016 - PRLog -- With the upcoming presidential election showing a higher possibility than ever that a woman will be in the White House, questions of whether women are driven by their emotions and avoid conflict at all costs, and how that might play into having a female president is swirling through many Americans' minds. "Two pervasive myths that negatively affect women are, one, that men decide on logic while women decide on emotions, and two, that women are more emotional than men," said Sofia Santiago, co-author of Difficult Conversations Just for Women: Kill the Anxiety. Get What You Want. "The truth is that no gender is more emotional, and that we all make decisions based on our emotions (and then rationalize them.) Moreover, thinking and feeling are not mutually exclusive: they are intertwined," Santiago explained. "It is true that women tend to avoid confrontations—both at home and at work—and doing that has serious consequences to our relationships, our life satisfaction, and even our income. But it is also true that both men and women are harsher on women," added co-author Dr. Susan Harrison. That is why Santiago and Harrison have founded The WikiWomen Academy for the Development of Professional Women and started the WikiWomen movement. A wiki is a type of website that allows collaborative modification of its content; everyone contributes and everyone benefits (like Wikipedia). A WikiWoman chooses to collaborate with other women rather than to compete with them. "When it comes to difficult conversations, the strategies that work for men don't work for women, and highly assertive women are not usually liked. He is a leader, she is bossy—or worse. Women struggle to find the right balance between being aggressive (a "witch") and passive (a doormat), explained Santiago, adding, "But it doesn't need to be that way. We can be competent and likeable." Dr. Harrison pointed out they have included in their book ground-breaking research, step-by-step techniques, and amusing stories they've compiled while speaking to thousands of women nationwide. "We have heard women say that the book had them both laughing and learning. That was our goal!" she commented. 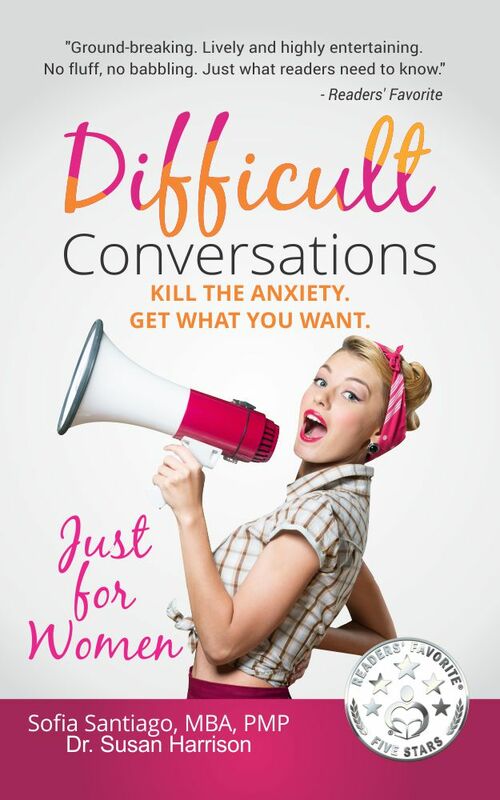 Difficult Conversations Just for Women immediately became a best seller and Amazon's number one hot release in three categories: Women in Business, Conflict Resolution, and Business Etiquette. Readers' Favorite has high praise for Difficult Conversations Just for Women, awarding it with their five-star seal of excellence. Here's an excerpt from their review: "Ground-breaking. Lively and highly entertaining. No fluff, no babbling, just what readers need to know. It is an excellent tool to help anyone understand the factors that affect effective communication, especially when women have to face men in both business and life, and how to handle emotions in difficult circumstances. The message couldn't be timelier!" To learn more about the book and/or to become a WikiWoman visit http://www.TheWikiWomenAcademy.com.